Obama also praised the workers at the Groton yard and their “particular genius” in building the sub. The $2.7 billion vessel is the 13th in the Virginia class of submarines, which can carry out a range of missions including anti-submarine warfare, delivery of special forces and surveillance. The 377-foot submarine will carry a crew of more than 130 and a payload of weapons including torpedoes and Tomahawk missiles. 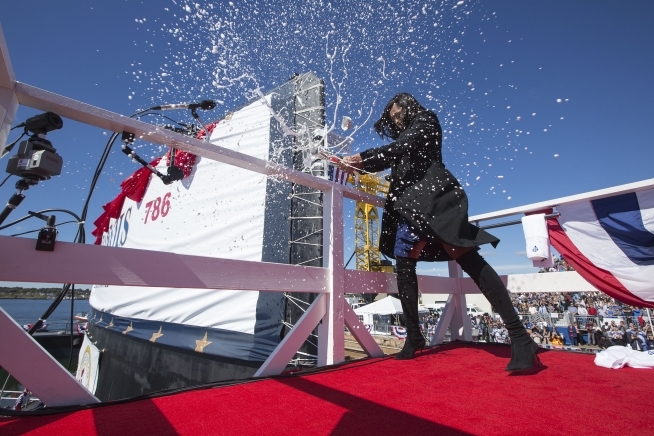 The first lady previously wrote her initials on a steel plate used in the sub’s construction at a keel-laying ceremony last year. She joins predecessors Laura Bush, Hillary Clinton and other first ladies who have sponsored submarines. Several Connecticut and Rhode Island officials, Illinois Gov. Bruce Rauner and Navy Secretary Ray Mabus spoke at the ceremony at the Groton shipyard of Electric Boat, a division of General Dynamics Corp. that builds the submarines with Newport News Shipbuilding in Virginia. Construction on the submarine began in 2011. It is scheduled for delivery to the Navy in 2016. The crest of the submarine features an outline of the state of Illinois, a white-tailed deer in honor of the state animal and foliage representing Illinois forest and prairie life. It also has a banner with the Latin words “Nemo Magis Fortiter,” or “none more brave,” a line from the Illinois state song. This entry was posted in Christenings and tagged michelle obama, obama, uss illinois. Bookmark the permalink.